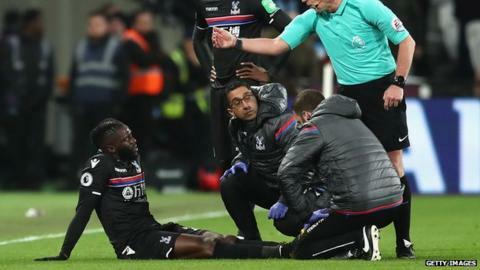 Crystal Palace forward Bakary Sako will miss the rest of the season with a fractured ankle and damaged ligaments, Eagles boss Roy Hodgson has confirmed. The Mali international, 29, suffered the injury during the 1-1 Premier League draw at West Ham on Tuesday. Sako scored six goals this season, despite starting just seven games. "Baky's injury is a very serious one," said Hodgson. "He certainly won't play again this season and may be a doubt to be fit for the start of next." Sako joined Palace on a free transfer from Wolves in August 2015. He scored twice in the past four games to help the Eagles climb to 13th in the league table, three points above the relegation zone.